Tip? Forget about trying to fit into that high school prom dress, or your favorite college outfit. Concentrate on feeling comfortable and confident in an outfit that suits you now. 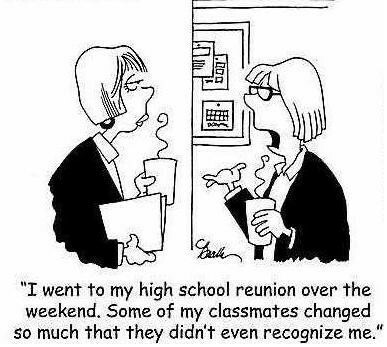 Class reunions are a fabulous way to reminisce with old friends and to gauge your own transformation through life. Make a point of attending and you won't be disappointed. Rebuttal: Look around!! I doubt any of us could get back into our jeans from high school any more. Rebuttal: Now that we're older and smarter, those cliques have dissolved just like the superficialities they were based on. The only cliques you'll notice at the reunion will be the sound of your joints as you walk around. 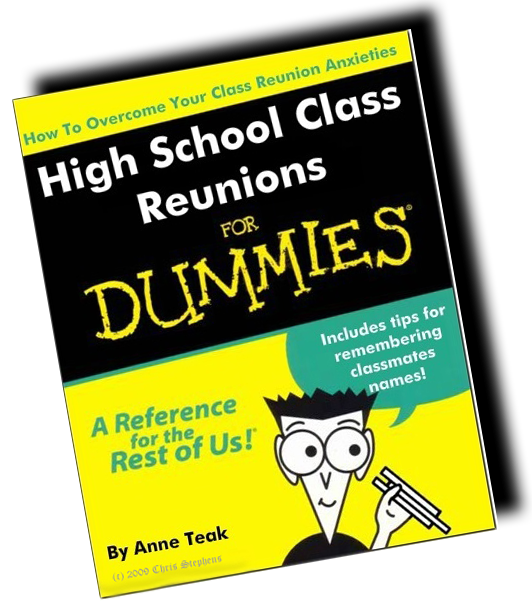 Excuse #6: It seems like all the classmates drink alcohol at the reunion. Rebuttal: Not all of us drink - plain and simple. Some of us only have a few drinks at the reunion to relax (cause we're nervous) but if you don't want to drink alcohol there'll be plenty of other drinks available.